Do you ever have students that avoid the technical skills assigned week after week, or are not so enthused about sight reading or rhythm drills? Instead of doing my typical Ice Cream Piano Party checklist or Piano Olympics during the summer months, I was inspired to try something new this summer that could be flexible enough to use for all of my students at various levels and add some variety and challenge. I was thrilled this week when one of my students walked in the door super excited to pass off some rhythm drills to get to the top of his "Rocky Ridge Rhythm Mountains" while his brother was able to stay on task better than ever beating his Music Ace game scores during piano lab for "Mount Killamanjaro." I made this simple Mountains to Climb tracking sheet and slipped it into a sheet protector at the front of each students binder. 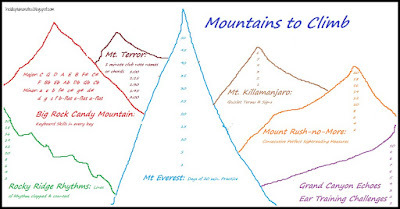 Each week I let the student choose which mountain they'd like to try and pass off achievements in during the first few minutes of lessons. Big Rock Candy Mountain - Pass off Keyboard Skills in every key. I use Music Progressions as my curriculum guide for keyboard skills including scales, chords, arpeggios, chord progressions, etc. Rocky Ridge Rhythms - Clap & Count aloud lines of rhythm drills. For early elementary I use Level 1 & 2 Rhythm sheets from ComposeCreate & then switch to Pianimation Rhythm Challenge Sets once eighth notes are introduced. Mount Terror- Name & play the notes on the the grand staff that students have been introduced to so far in less than a minute. The Notes in the Fast Lane worksheets by Susan Paradis in my teaching binder are topped with pink highlighter tape with students' names and times to track how far they have progressed. 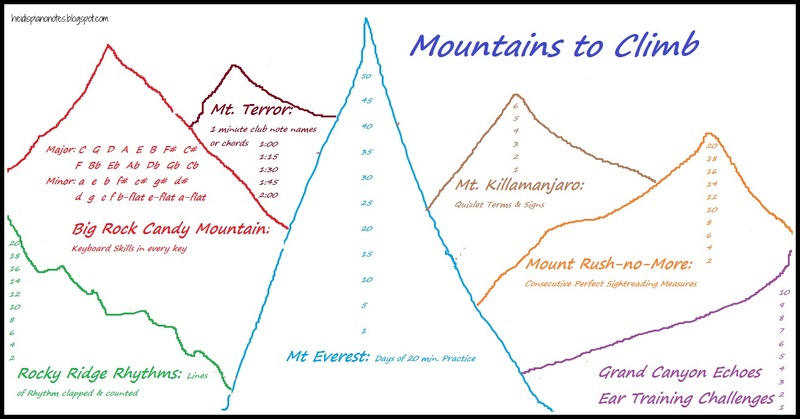 Mount Killamanjaro - Master theory terms and concepts by playing Scatter on Quizlet in 30 seconds or less (see links on Piano Lab page at the top of the blog) or by beating there own high scores on Music Ace Games during piano lab. Mount Rush-no-More - Sightread as many measures as you can in a row with perfect rhythm and notes. Both Pianimation Sightreading Challenge Sets and Diane Hidy's sightreading flashcards are excellent resources for this challenge because they slowly but progressively get more challenging. I play the excerpt along with the student and love how they get more and more careful about playing at a slow tempo and looking over the selection before playing because they don't want to make a mistake and start over at zero with even harder music! Mount Everest- Of course success in all of the other skills in piano hinge on PRACTICE - the biggest mountain to climb! The first 3 student to climb 3 of the mountains received a gift certificate to the local ice cream shop and there will be another larger surprise reward at the final group lesson of the summer for students who successfully reached the top of all of their mountains. This is amazing! Is it ok if I use the image in my studio next year? Your welcome to use it!